I got a gift certificate from Manang’s Chicken in the mail today. 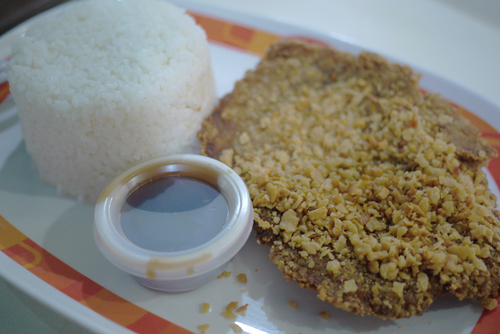 After I got over the excitement of actually being able to touch my correspondence, I got all worked up again thinking of a decent-sized deep-fried pork chop sitting beside a cup of white rice that is supposedly all mine – for free! I gave the paper a cursory glance to assure myself that I’m not being taken for a ride, and then heeded the lure of flavorful meat, partially hydrogenated vegetable oil, and starch. Off I went to Glorietta 4, braving Makati traffic on a busy Saturday afternoon in this bipolar weather. I figured even with the extortionate parking fee, I’m still saving money because of the free lunch. Besides, I needed a new pen. I got a side order of potato chips so as not to feel like a total freeloader (with garlic mayo dip, to complement the garlic pork – genius, right?). 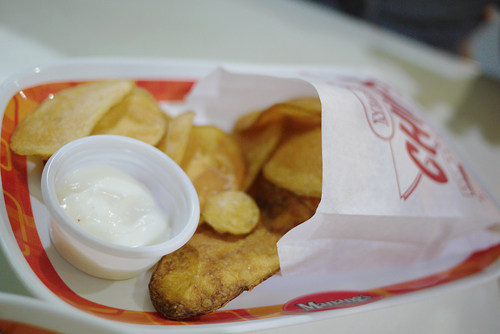 It was surprisingly good – crunchy, not oily, and well-seasoned. But as for the main event… well, how does one say this nicely? It’s one of the most expensive pork chops I’ve ever had. The meat gave my teeth quite a workout, and the crispy breading nearly lacerated the roof of my mouth. The garlic bits were a tad overpowering, which was a relief in this case, because otherwise the dry, rubbery pork would have been impossible to choke down. The juice and rice were nothing to write home about, but they were still better than the pork chop. Alas, I stopped eating halfway through – me, the person who doesn’t stop eating until he hates himself (to paraphrase the great Louis C.K.). Not even the red motif could save my appetite. Needless to say, I skipped dessert (which would have been a velvet sundae that looked promising) and instead walked listlessly around the mall, trying to think of ways to salvage my afternoon. 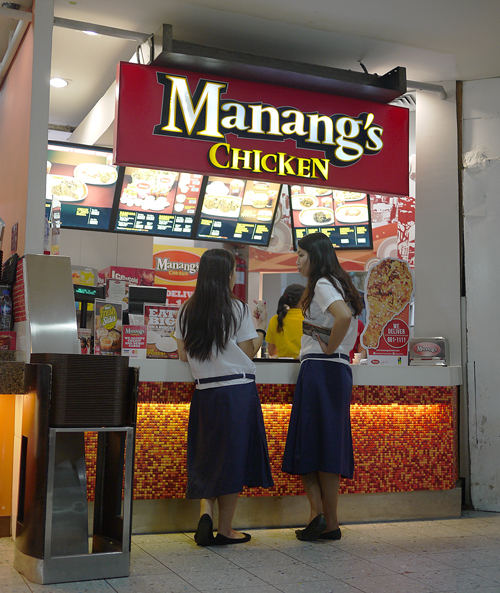 To Manang’s Chicken, thank you for the free garlic pork meal. Will I come back? Definitely – for the potato chips, and to try out the soy chicken. I’ve heard comparisons to Bon Chon (with a Pinoy twist) that left me intrigued. But I will pay for my meal next time, because obviously, the aphorism “masarap kumain pag libre” does not apply to me. This entry was posted by Leslie Anne Go, who has written 8 posts as leslie, on Monday, October 7th, 2013 at 8:30 am and was filed under Fast Food.